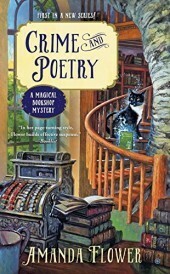 Crime and Poetry is a cozy mystery set in a magical bookshop! Charming Books is set in Cascade Springs, not far from Niagara Falls. The quaint, upscale town of Cascade Springs is known for its water, which residents claim has healing qualities. The bookstore is magical in the fact that YOU don’t pick your book, the perfect book picks YOU! Daisy runs Charming Books and is Violet’s fun and quirky grandma. Violet left Cascade Springs 12 years ago after a tragedy and public embarrassment, and has only returned to care for her grandma. When Daisy’s friend is found murdered, she becomes a prime suspect. Violet makes it her mission to clear her grandma’s name. Complete with magic, mystery, history, and a dash of romance, Crime and Poetry is a charming, cozy read to curl up with and enjoy!